These few weeks I have been busy with sumptuous surfaces online class, embroidery on tunic, TAST challenge and hussif challenge and a weeklong trip to Chennai. The class is over. But I need to think and work on the exercises to improve my ability. 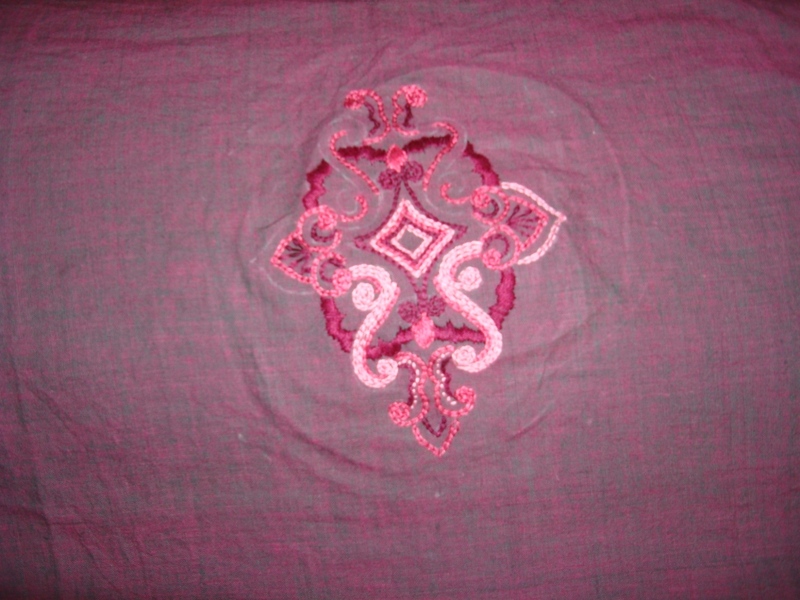 My tailor is back from his vacation, my DH is going to office, so I have started the routine of designing and embroidering on tunic fabrics. The explorations of the TAST challenge stitches need restructuring. Which I have to work on. I am searching for floral sprays and decorative seams for the crazy quilted hussif. This is WIP. Blogging regularly is added to this list. Sharon had pointed out this flickr page on her blog. This is site so very useful.I never seem to get satisfied with the designs I have, and also love vintage patterns.This is a great resource for this. Another site I found very inspiring for crazyquilting, henna designs, rangoli, needlepoint,seamtreatments,desinging borders, motifs-zentangle. their gallery is full of ideas. Yesterday I joined this new[? maybe for me] group on ning on hand embroidery.I have to put in more efforts towards this new venture. I visited this blog by Judy. She is sharing her expertise with the world through her blog. beautiful and useful designs. I also came across this BAS[Build A Seam] challenge on this blog. Seems quite interesting. Iam fascinated by crazy quiting seam treatments, I haven’t started on them so far, but the eyecandy available for this artform on the blogs are countless.On oneside Iam inspired to start and do lots, but Iam dejected to start sooooooolate, when will ever do all these things? 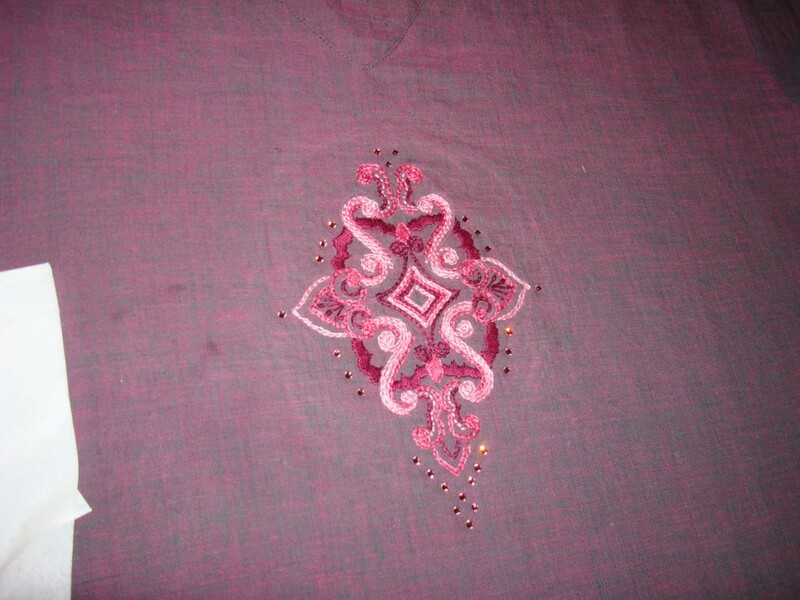 I am cheating now, I have started taking closeup shots of my tunic yokes, to pass them of as decorative seams. [very smart]. Another request came for kutchwork tutorial , I ‘ll start working on them , and post the pictures and tutorial SOON. We are going on vacation to India tomorrow, I might not post any entries while Iam there.I hope I can work on my embroidery over there, last time a crack on my right pinkie did not allow me to work for a whole month. InIndia the navarathri and diwali festivals are celebrated in a grand manner.Asusual there will be lots of sweets,lentils,shopping, and indigestion. Happy Navarathri! and Happy Diwali! Most of the days I spend some time browsing the net – embroidery related.There are so many blogs on this needle craft.These blogs are individually and collectively very good.Each and every person is so talented in their unique way.And there are so many blogs too.I control myself and browse only an hour every day.All of them inspire me.It’s like an ocean- and Iam looking for fishes.For quiet some I wanted to write about this.I like how they make such cute small scale embroidery,most of the blogs I don’t even understand the language- this craft goes beyond languages.Some people are so generous-they share their patterns. Iam new to blogging- I don’t know so many things on it, my typing is very slow, these are only few of the obstacles. but today I made some progress and have added a f ew links on my blog roll, I ‘ll try and continue with this task regularly.